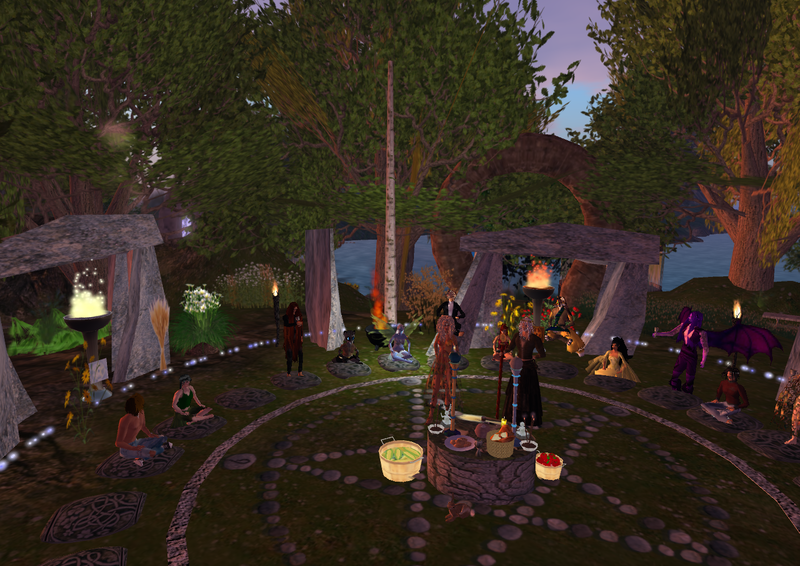 A Lammas ritual on Gaia Rising. As a shy and hesitant neo-pagan solitary, finding and practicing with others was a little scary. It was much easier to find a group in Second Life where an avatar could stand in for the real me. Although the partying pagans of Artemis Tavern were friendly, I craved quiet and reverence. I found that in the Anam Turas group. On their sim, Gaia Rising, I found a sacred grove area. Seeing an altar with nicely detailed tools laid ready for use was much better than the line drawings or descriptions I had found in books. While the tools were decorative and unscripted, the ritual area had a magical cauldron to incinerate notecard wishes, a clickable ball that closed the circle with white particles, and stone bowls on pillars (which fired up colored particles on a click) at each of the four directions. I practiced there and in the circle dance areas, the singing chakra meditation bowl gazebo, and at a grove dedicated to the Green Man. Paddling along in a canoe, I discovered a shamanic journeying blanket. Seeing all these ritual areas laid out in a matter-of-fact way and being able to try them dispelled my fears. I remember quietly sitting in my first Anam Turas ritual hoping no one would ask me to do anything and yet wishing I could. There I was in quasi-fairy blue-skinned winged avatar with a monk, a dragon, a few robed human AVs with pentagrams, a humanized otter and an AV covered in a violent shade of violet. I felt right at home. And I did finally get the courage to call a quarter for a subsequent ritual. 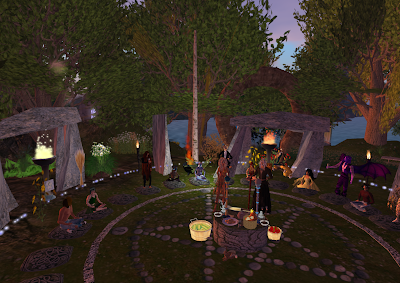 Those SL experiences gave me the confidence to participate in first life groups such as: the Earth Centered Spirituality workshop and group in my UU church, a local urban pagan church and a local rural pagan church. Eventually getting the courage to become immersed by participating in a pagan festival and retreat. Gaia Rising is still a welcoming place for exploring paganism. Their one sim has expanded to four. Each Sunday there’s an informal discussion of all things pagan. Avatars from around the globe chat, in voice and in text, about their lives and direct experiences with natural energy. Perhaps I’ll see you there. 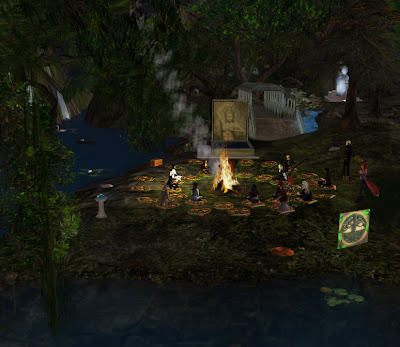 Weekly informal pagan discussion on Gaia Rising.